Ever since the end of Infinity War Marvel fans have been worried about what’s going to happen to their favourite Avengers when they face the deadly titan Thanos next year. Most of the speculation centred on Robert Downey Jr’s and Chris Evans’ characters, because their contracts are allegedly about to expire, with fans guessing both Tony Stark and Steve Rogers would make the ultimate sacrifice to save the universe. These fears were seemingly confirmed last week when Evans thanked the fans for supporting him over the last eight years on Twitter, adding that playing Cap had been an honour. 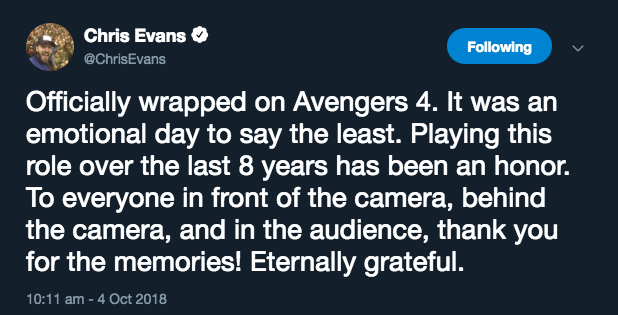 Fans were understandably freaked out at the tweet taking it as confirmation that Evans had hung up his shield for good, despite Cap promising us ‘he could do this all day’. Commiserations may have been premature, however, as Chris has since backtracked on that original tweet claiming people have read a bit into it. I should clarify that I know I did tweet something that made a lot of people think that it was in some way a spoiler. I should clarify that regardless of how Avengers 4 ends, I would have tweeted the exact same thing. That last day of filming was a very emotional day and it was the culmination of almost 10 years of filming and 22 movies, this unbelievable tapestry. You feel a lot more emotions than I think even I thought I’d feel. And I felt it was appropriate to share the gratitude. I know it had a ripple effect but I am neither confirming nor denying anything. 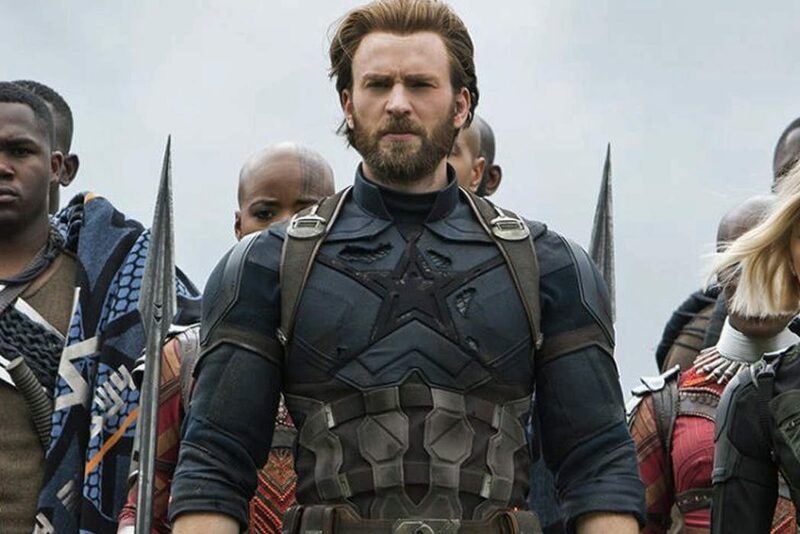 Earlier this year Chris Evans made it clear that he’s ready to retire from active duties telling the New York Times that he wants to ‘get off the train’ before he’s pushed. Even if Chris is done with Captain America at least we’ll get to enjoy him one last time in the currently untitled fourth Avengers film. The current theory is that the film will be titled Avengers: Annihilation but let’s be honest no one really has a clue aside from the good folk at Disney and they’re keeping quiet about the title. Not that that’s stopped the cast and crew teasing us all with the reveal. Last month the directors, the Russo Brothers, released a cryptic Instagram post which people guessed may contain the title. The best theory I saw was that the picture contained 4 As (as in Avengers 4) but others were convinced they could see all sorts of words in there including Endgame. Whatever it’s titled Avengers 4 will see Earth’s mightiest heroes team up to try and undo the damage Thanos has done to the universe with the help of the newly introduced Captain Marvel. Avengers 4 will be released in the UK on April 26, 2019, and in the US on May 3, 2019.